Andy Cohen, Bravo’s executive vice-president of original programming and development, is diplomatic when asked about his favorite show on the network: “They’re all my pets,” he says. Lately, though, the network has gone Top Chef–heavy, wrapping up the All Stars season and premiering the latest edition of the show’s Masters spinoff. 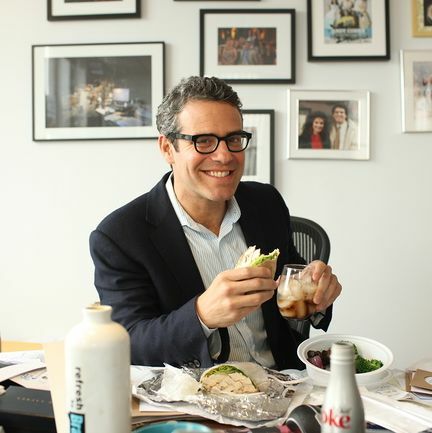 But Cohen also hosts his own show, Watch What Happens Live, which has made the exec a star in his own right — he tells us he’s frequently recognized when he dines out. “People say, ‘Oh, I love the Housewives,’ or, ‘I love Top Chef,’ or ‘I love your show,’” he says. “It’s nice. People are nice.” To see where you might bump into him, read on in this week’s New York Diet. I hosted an event at the Charles Schulz Museum on Thursday, and then I stayed a couple of days in San Francisco. Breakfast was room service at the San Francisco Four Seasons: a fruit plate, wheat toast, and English Breakfast tea. Very boring. For lunch, I overdid it at the Slanted Door. We ate family style: glass noodles with crab, filet mignon, spicy chicken breasts, grilled shrimp with onions, and cotton candy for dessert. Friday was a night where I had a bunch of people to see in San Francisco. Some old high-school friends of mine were having an early dinner, so I said, “I’ll just come and sit with you while you eat at Zero Zero,” and I noshed on a slice of broccoli pizza and had two bites of pasta. Then I went to have my actual dinner with my friend at Prospect: asparagus with some kind of cheese and walnut sauce, then chicken breast with Cheddar grits. I had two Belvedere-and-sodas with a splash of OJ. Typically on weekends I just eat a big breakfast and then I won’t eat, and then I’ll have dinner. Breakfast was room service again, this time an egg-white omelette with onion, mushroom, and spinach, with wheat toast and English Breakfast tea. The caffeine in coffee makes me dizzy. Whenever I start drinking coffee, I drink Starbucks, and it’s like, polluted. I can’t really drink it anymore. The caffeine in tea, for some reason, it just treats me better. For a snack, I had a chocolate-chip cookie from Coffee Bean & Tea Leaf and another English Breakfast tea. I wasn’t working, so I just saw a lot of friends, I shopped, I took walks, I ran outside … just ran around town. Dinner was at Wayfare Tavern, Tyler Florence’s restaurant. So good. I had yellowfin tuna crudo over fried oysters, and Scottish salmon vichyssoise with a side of roasted mushrooms and garlic. Dessert was pineapple upside-down cake, and I had two Belvedere sodas, splash of OJ. It was a great meal. Breakfast was on United Airlines: some kind of omelette, yogurt, bagel, fruit, and tea. It was all right. Then I had a chocolate-chip cookie and tea on the plane for a snack. It was dinner time when we landed in New York, and I went with a friend to Café Cluny. I had a mixed green salad, roasted chicken that, I think, had Israeli couscous or something with it? And a side of Brussels sprouts and a Diet Coke. We did Watch What Happens Live that night, and I had Coke Zero, chips and dip, and ten M&Ms; from the craft-service table. I had one Maker’s Mark and ginger ale during the show, and one after. Curtis Stone was on for Top Chef Masters with NeNe Leakes. They got along great. Breakfast at home was one piece of dry, whole-wheat toast and one cup of PG Tips tea. I went on the Today show, just talking about what was going on in pop culture, and I ate a quarter of a glazed doughnut in the green room. Later at a photo shoot, I had ten almonds, five cashews, and a late lunch of grilled chicken, a mixed greens salad, and quinoa. So much of my diet is from craft service, it’s crazy. I had dinner at the Point Foundation Honors at Capitale, downtown. It was me and Grethe Cammermeyer being honored. I had a couple bites of steak, a piece of bread, vanilla ice cream, and two vodka sodas. I had breakfast at the Women@NBCU Power of the Purse Breakfast: a bagel and lox, and black tea. For lunch, I went to City 75 at Rockefeller Center. It’s a take-out-y place with a big buffet with a lot of fresh food and fresh vegetables. When I’m in New York, I go there almost every day and just eat at my desk. I did a build-your-own grilled-chicken wrap with lettuce, grilled mushrooms, and broccoli, and had a Diet Coke. I had a snack of two mini dark-chocolate eggs from Li-Lac Chocolates and drank lots of water. Then dinner was at the Real Housewives of Miami live reunion special. I had grilled chicken with onions, then went nuts at craft service! Five chips with dip, three non-pareils, six Swedish fish, and a Coke Zero. After the show, I guzzled a Maker’s Mark and ginger ale faster than I thought possible. It was like a pat on the back for a job well done. Breakfast at home was an English Breakfast tea and a plain piece of toast, and after I worked out I had an Amplified Recovery Protein Shake. I went to the Palm for lunch and had a mixed greens salad, grilled salmon, broccoli with garlic and oil, and three bites of cheesecake. I had an Earl Grey Starbucks tea, and two Li-Lac mini dark-chocolate eggs, and dinner at Morandi, where I go a lot, along with Café Cluny. I had a bibb-lettuce salad, meatballs with pine nuts and raisins, a side of spinach, and a Diet Coke. Wednesday was a pretty typical workday. Just working out in the morning, meetings, and then dinner after work with some friends.